In the horror of war, dark things rise, and World War II is history's greatest conflict. The Japanese stalk the jungles of Southeast Asia. Carriers battle in the South Pacific. Tanks trundle across North Africa. Planes duel over England. The Nazi blitzkrieg conquers most of Europe with a genocidal madman at the controls. Prepare to battle the evil of the Axis powers and the hideous things that rise in their wake. This isn't just war - this is Weird War! This book contains everything you need to run horrific Weird War Two adventures with the Savage Worlds game system: new powers, Edges, Hindrances, weapons, vehicles for all the major powers, an Adventure Generator, dozens of Savage Tales, new monsters, and an operational-scale Plot Point Campaign that ties it all together. 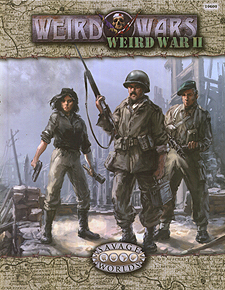 Weird War II requires the Savage Worlds core rules to play.